Get ready to meet five forward-thinkers, all of whom are helping to lead trucking by example in various ways that point the way to overcoming challenges and leveraging opportunities. Heavy Duty Trucking’s 2018 Truck Fleet Innovators were honored for their leadership in areas such as fuel economy, driver health, the driver shortage, smart growth, and data-driven decisions. Each year, Heavy Duty Trucking’s editors review nominations sent in from across the industry as well as give consideration to fleet executives they’ve met over the year. 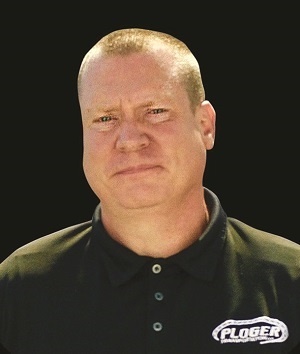 The editors then single out several fleet executives who have consistently shown innovation and leadership in one or more areas of truck-fleet management. Our five 2018 Truck Fleet Innovators, sponsored by Phillips Industries, will be honored during the second annual Heavy Duty Trucking Exchange. HDTX is an invitation-only fleet networking event to be held May 9-11 at the Scottsdale Resort at McCormick Ranch in Scottsdale, Arizona. Following an awards ceremony, this year’s Innovators will participate in a panel discussion on industry-wide issues. For Joel Morrow, the road to advancing truck technology is paved with attention to detail, mile after mile. If Joel Morrow calls you, chances are he’s reaching out while taking a break somewhere on a revenue run. Chances are, too, that he’s making that run at the helm of some impressively advanced iron, including trucks that may be fitted with components no one can buy yet. How he became a driver and test pilot rolled into one starts, as do many trucking stories do, with his family. Morrow’s owned a trucking outfit when he was growing up. 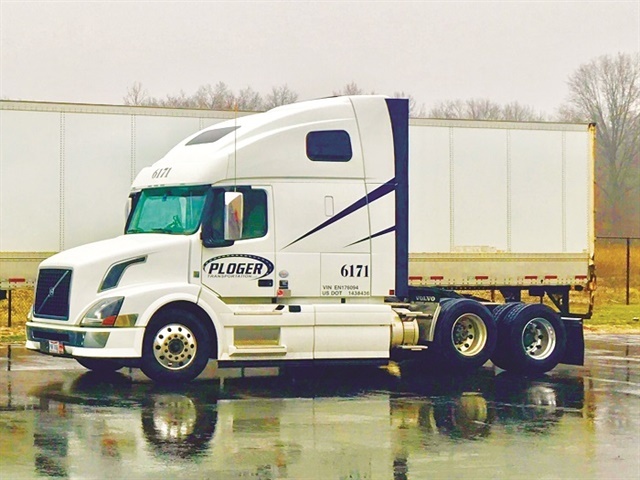 He, his brother Jerry, and Jerry’s wife Tanya got together to launch Ploger as a regional carrier with one truck in 2006. The company has since grown to 40 tractors, all piloted by company drivers, with 100 van and flatbed trailers, specializing in hauling food products to distribution points for brand-name companies such as Pepperidge Farm. Outbound, the fleet moves mostly high-cube, multi-drop loads to customer locations east of the Mississippi. Backhauls are diverse and heavier, ranging from steel coils to scrap paper. Morrow says a typical run might cover 800 to 1,000 miles, with seven or eight outbound drops followed by a single-stop backhaul. Morrow took part in the Run on Less fuel-economy event put on last year put on by the Carbon War Room and the North American Council for Freight Efficiency. On the 50,000-mile run over 17 days, seven professional drivers managed to average 10.1 mpg overall — demonstrating just how far technologies available on the market today can push fuel efficiency. 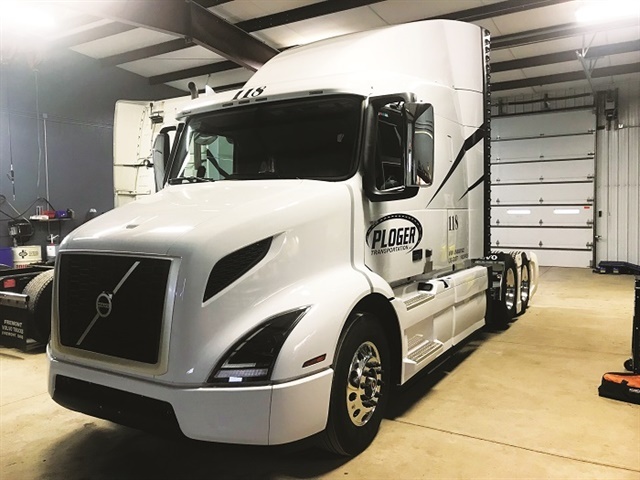 Morrow piloted a 2016 Volvo VNM62T630 sleeper-equipped tractor on that run, one of the trucks in the Ploger fleet that helps maintains an overall average of 8.5 mpg. Ploger operates sleeper-equipped Volvo tractors. To help wring the most fuel out of the trucks, Morrow specs a downsped powertrain built around the OEM’s 11L diesel with Eco-Torque option. The engine is rated at 385 hp at 1,250 to 1,450 lb-ft of torque and is mated to a direct-drive I-Shift automated transmission. Also helping, the trucks roll green on low-rolling-resistance tires. In addition, drivers get some help thanks to a fuel-efficiency coaching system in the cab. An aerodynamic assist beyond the standard tractor treatment comes from setting the tractor-trailer gap at 42 inches, putting on tandem-axle wheel covers and adding tandem gap fairings. The fleet is also looking at trailer aerodynamics, such as a new type of split trailer side skirts and a boat-tail device. But what stands out the most of late is Volvo’s Adaptive Loading option, which Morrow says helps boost fuel economy too. This 6×2 drive-axle configuration is distinguished by a liftable forward axle that automatically adjusts to load weight changes and provides for 4×2 operation in certain conditions. A vocal proponent of testing out new technology, even trying pre-production equipment concepts on revenue runs, Morrow is all about pushing the envelope to stretch Ploger’s fuel dollars. “Our fuel economy strategy is to do research and development with real-world testing to make sure we are right about our specs in our operation,” he explains. “Proving out the 6×2 adaptive loading axle concept is the big thing we are into now,” Morrow points out. “We’ve run with the lift axle up more than half the time” when hauling cubed-out loads. According to Morrow, there’s no parasitic loss from an unnecessary second drive axle, and not having the extra set of tires on the ground cuts overall rolling resistance. While he has opted for a sway bar on the front suspension, he hasn’t conducted fuel economy tests on it. But he figures that it cuts tire costs, because it saves on the corrections a driver has to make that cause tire scrub and uneven wear.